I'm at it again: Another little DIY project in the Frantic Mama household. We converted a small room in our basement into a guest room, and like most guest rooms, all of our least favorite furniture ended up there. While it looked fine, I wanted to spruce it up. I am always happier with a project on my hands [even if it takes forever to complete because I can only work on it for 5 minutes a day with two little monkeys children on my hands]. 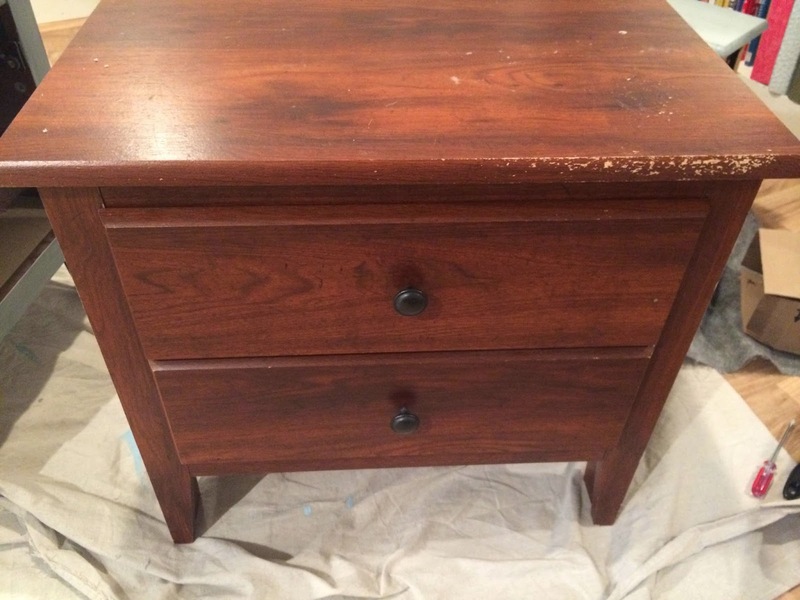 My husband bought an inexpensive 3 piece wood veneer dresser and side table set at Target about 10 years ago (how is that possible?) before we were married. They were passable but a little rough around the edges at this point. We recently repainted the playroom, and FranticMamaHubby had gone a little overboard on gray paint samples-- he was determined to find the perfect one. As a result, we had LOTS of samples of lovely gray paint sitting around. I hate wasting anything...but then I had a light-bulb moment: I could use the samples to refresh the old Target furniture! 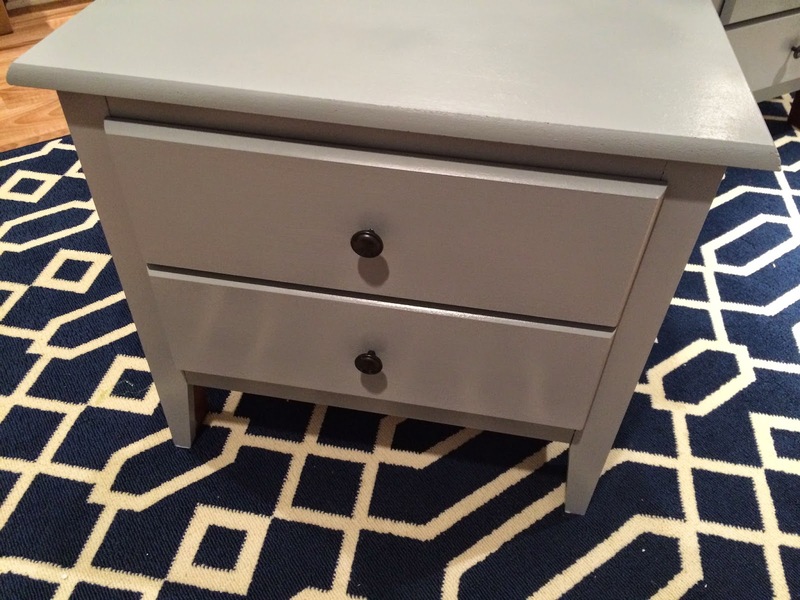 The two small side tables needed just one container of the Benjamin Moore sample paint (2 coats each). I used the shade Cobblestone Path, a soft gray with slight blue/green undertones. Once the two coats of paint dried, I sprayed on a coat of Rustoleum Clear Gloss to give them a shiny, finished look [Major Important Tip: You should spray paint outside or your entire house smell for at least a day]. It took a little elbow grease, but as always around this house, the hardest part was finding time to paint without my kids hanging on me. Mission Accomplished! P.S. I'm honored that Mamalode is sharing my piece about the postpartum anxiety that many mothers face but few discuss. Read Angel in a White Coat here, and please share with anyone you think might benefit. What DIY project have you tackled or hope to tackle? Do you have a favorite DIY website or Pinterest board you follow?